Deciphering the signaling pathways that govern stimulation of naïve CD4+ T helper cells by antigen-presenting cells via formation of the immunological synapse is key to a fundamental understanding of the progression of successful adaptive immune response. The study of T cell-APC interactions in vitro is challenging, however, due to the difficulty of tracking individual, non-adherent cell pairs over time. Studying single cell dynamics over time reveals rare, but critical, signaling events that might be averaged out in bulk experiments, but these less common events are undoubtedly important for an integrated understanding of a cellular response to its microenvironment. We describe a novel application of microfluidic technology that overcomes many limitations of conventional cell culture and enables the study of hundreds of passively sequestered hematopoietic cells for extended periods of time. 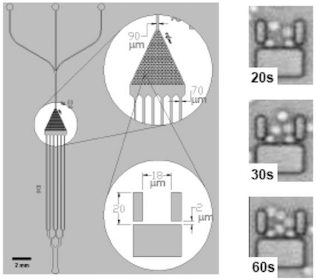 This microfluidic cell trap device consists of 440 18 μm x 18 μm x 10 μm PDMS, bucket-like structures opposing the direction of flow which serve as corrals for cells as they pass through the cell trap region. Cell viability analysis revealed that more than 70% of naïve CD4+ T cells (TN), held in place using only hydrodynamic forces, subsequently remain viable for 24 hours. Cytosolic calcium transients were successfully induced in TN cells following introduction of chemical, antibody, or cellular forms of stimulation. Statistical analysis of TN cells from a single stimulation experiment reveals the power of this platform to distinguish different calcium response patterns, an ability that might be utilized to characterize T cell signaling states in a given population. Finally, we investigate in real time contact- and non-contact-based interactions between primary T cells and dendritic cells, two main participants in the formation of the immunological synapse. Utilizing the microfluidic traps in a daisy-chain configuration allowed us to observe calcium transients in TN cells exposed only to media conditioned by secretions of lipopolysaccharide-matured dendritic cells, an event which is easily missed in conventional cell culture where large media-to-cell ratios dilute cellular products. Further investigation into this intercellular signaling event indicated that LPS-matured dendritic cells, in the absence of antigenic stimulation, secrete chemical signals that induce calcium transients in T(N) cells. While the stimulating factor(s) produced by the mature dendritic cells remains to be identified, this report illustrates the utility of these microfluidic cell traps for analyzing arrays of individual suspension cells over time and probing both contact-based and intercellular signaling events between one or more cell populations.